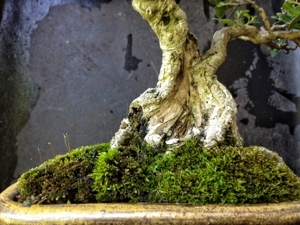 My friend Jerry asked me to do a post on moss. And it seems to be a required subject so….here we go! voice. His moss recipe should work in most places. It’s this moss that he is talking about being chopped up and used. I’ve seen this recipe given with an addition of buttermilk or yogurt (plain). Please feel free to share your recipe in the comment section below for the other readers to try. So how do I get moss? What I first did was collect it. In places like this. And I would also just steal it off of other trees and plants. 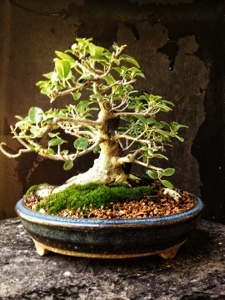 Like on this ficus Burt Davyi, it will grow to cover the pot in time. Look up moss and you will be surprised. 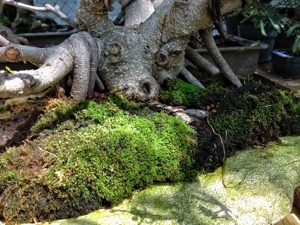 Here are some “fun facts” : There are over 12,000 kinds of moss. They don’t have flowers or seeds. They reproduce with spores. That spike that looks like a flower is called a sporophyte. They are also non-vascular. Meaning they don’t have xylem or phloem and they don’t have roots per se either. Which is one reason they can’t get tall. And also why they need lots of water. They can be desiccated (totally dried) and come back to life soon after water is reintroduced. 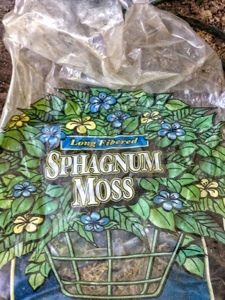 Hence the dried sphagnum in a bag being used to make new moss. 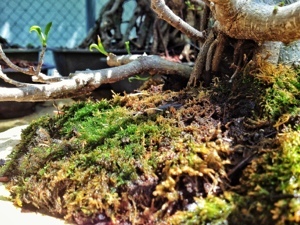 To reproduce ,the moss needs water,because, surprisingly, they have sperm. Which needs water to swim in to get to the “egg” (archegonium). Neat so far, huh? I could go on because they are so interesting. I suggest you explore on your own. The moss family seems so alien. 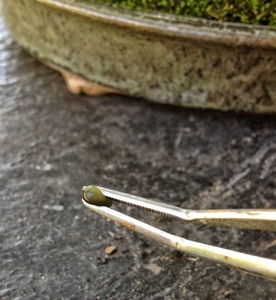 This is how I make moss. I got the idea from Erik Wigert. 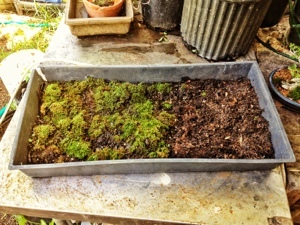 Every time you pot or repot a tree you put whatever moss you have left over, no matter how little, into a tray like this. Or a shallow pot. Put it in the shade and keep it watered. It will grow. use a fine grained soil as it seems to grow quicker on that. When it’s time for a show just transplant it onto your tree. It is pretty, I’ll say, and it does keep the tree healthier. Perhaps it adds to the ecosystem of the soil. Or makes it more conducive for the ecosystem to thrive. 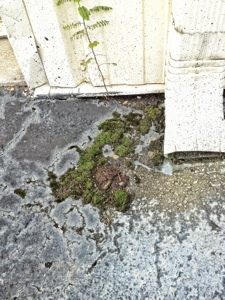 It does make it difficult to fertilize because the fertilizer will kill the moss. As an example, this ilex struggled and was always more yellow in the leaf than my other ilex before I put moss on it for a photoshoot. And now it looks good. We need a scientist to explore this. Now it is very happy. 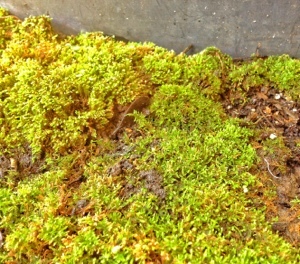 Sometimes moss is essential in keeping the soil onto the planting. 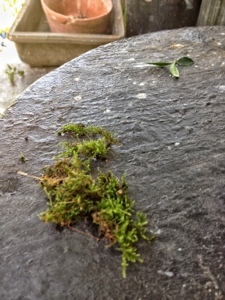 This slab-planting’s soil would just scatter and wash away without the moss I placed on it. 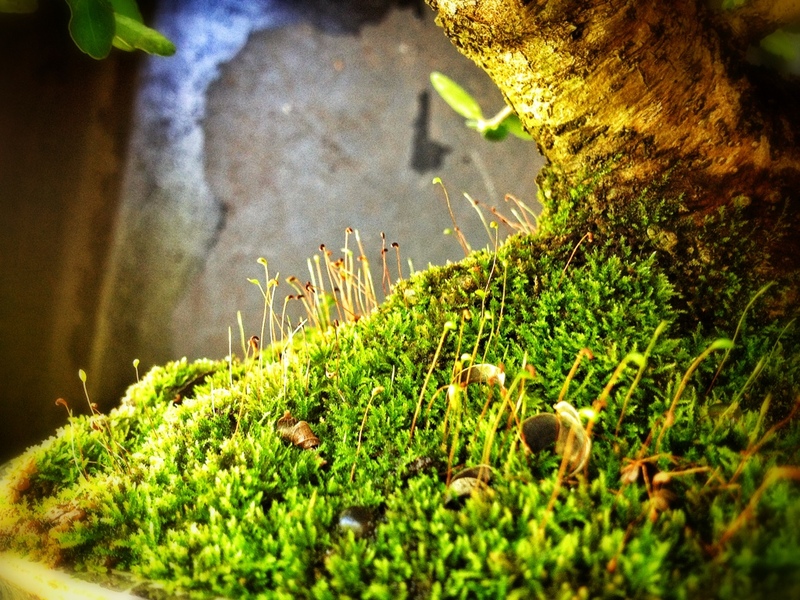 Moss doesn’t need soil to grow. The surface it grows on is called the substrate. 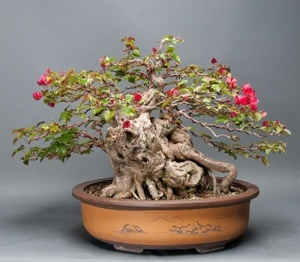 Which could be soil, or rock or the trunk of this bonsai. 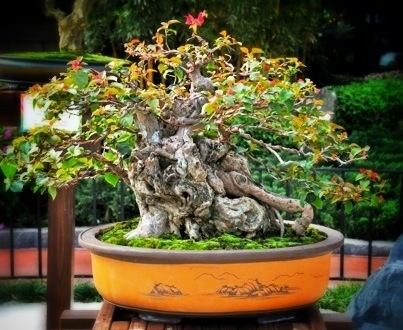 It grows better on a bonsai if you cover the top layer of soil with a top dressing of “shohin mix”. The sifted soil that has particle size of 1/8th to 1/16th of an inch. This is where the wife’s favorite toothbrush comes in handy. Wet the bristles and scrub gently. She prefers medium bristles. 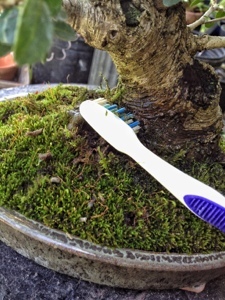 Brush, brush ,brush. 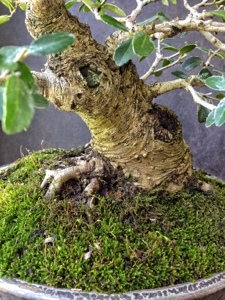 Look at that, we have a nebari. 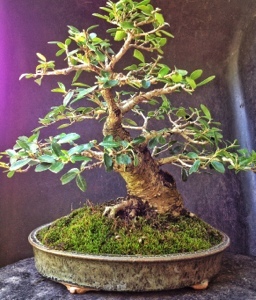 I just trimmed this ilex so it’s a little sparse. But, damn, look at that moss! I’ve had this particular moss colony for over 2 years now. 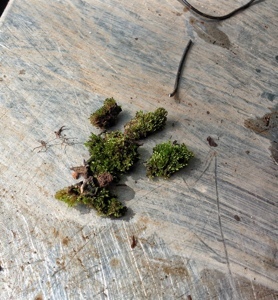 In addition to spores reproducing moss, some species will reproduce asexually; by parts of the plant body falling off and establishing itself as a new plant. 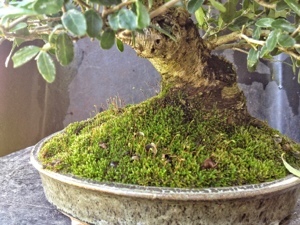 Which I think is how most bonsai moss grows. So you end up with a clone colony. Sounds like a cheesy sci-fi story now. Sometimes you’ll get browning on your moss. Just keep it moist and it’ll grow back in eventually. Slime mold is actually not a mold (fungi) at all, but it is slimy. It can move too. Almost like an animal. Look it up. 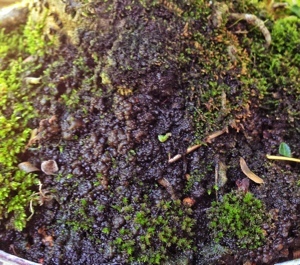 Any way, you can buy a “moss milkshake” or various other products to “grow” moss online. Or do what I did, just hunt around looking for your own to “start” with. 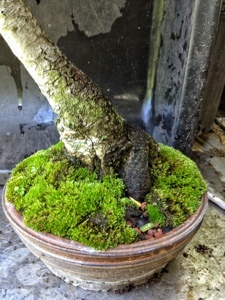 The current batches I have came from a pond that was low and the moss grew at the bases of cypress trees. My brother-in-law Steve found it and collected it for me. And with moss. Which looks better? To conclude, moss doesn’t hurt. It might actually help. Makes you the envy of your peers. And is so darn soft to touch. I’m certainly putting it on more of my trees. 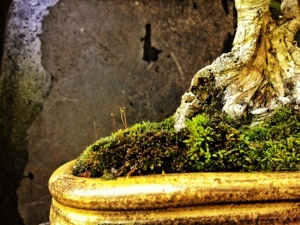 If for no other reason than the fact that- chicks dig moss too! Great article! Moss is amazing! I know what you mean about how it some how makes your plants healthier. I think that maybe it prevents or reduces the amount of soil erosion caused by watering by acting like a filter. 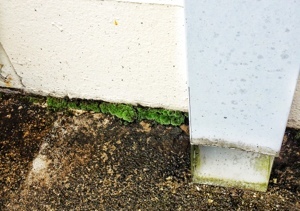 Large scale moss growths should be used in protected lands where soil erosion is imminent. It does something, I’m learning. I’ve read about a ‘moss milkshake’ where you take a clump of moss, some beer, buttermilk and a bit of water, and mix in sacrificial blender. This is blended and the resulting sludge is poured over a tray of soil and left in a shaded area to grow. Haven’t tried it but it apparently works (in some climates). Thanks for the post ( and all others) very helpfull. Keep up the great work. Howdy very nice site!! Man .. Beautiful .. Amazing .. 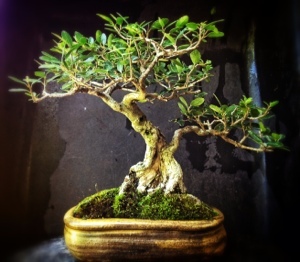 I will bookmark your website and take the feeds also?I’m happy to seek out numerous helpful information here within the submit, we’d like work out more strategies in this regard, thank you for sharing. . . . . .
A Great Post on How to Moss a Tree!! Is slime mold bad? How do I get rid of it?